When it comes to furniture chests are some of the oldest and most versatile pieces still in use today. Also known as coffers, kists or wakis, they not only served as storage units but also functioned as benches, tables, wagon seats and even writing desks. You’ve probably got a cousin of that original ‘kist’ in your own home. Even better, maybe it’s time to add another? The most universal place to use this piece is in the bedroom. Bedroom sets are the most common way to decorate this room and they are generally comprised of a headboard, dresser and matching chest of drawers. However, you don’t need to be stuck with the often-dated look that being too ‘matchy’ with your furniture choices creates. Purchasing a bedroom chest of drawers in a different style and material will accent your decorating scheme rather than create a uniform feel. Look for unusual finishes and colours or even a hand painted design to bring a touch of character to your space. Choosing something that echoes existing elements in the room such as a favourite pillow or picture will create harmony without the boredom of uniformity. Whether it’s pirate booty or your favourite band t-shirts, your treasures deserve to be stored in style. You could spend your time being harassed at commissioned furniture shops or answering seedy craigslist ads for ‘chest drawer for sale, or you could take your search to the next level. 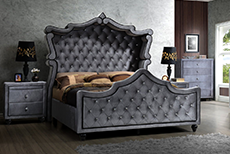 If you’re looking to add a new chest for bedroom décor, our experts at 1StopBedrooms are on hand to help you make the best choice. Whether you’re looking for a simple, affordable addition or you’re looking to purchase an heirloom we are confident you’ll find what you need. Unsure if your choice will work? Our highly experienced furniture specialists are available for online chat as you shop. They’ll help guide you through the decision-making process and ensure that your experience is pressure free and as enjoyable as shopping should be.